In partial explanation for the dearth of posts over the last year or so, new projects have been afoot. It has included more doing and less writing about it, but also a new project with filmmaker Luke Rosen. The first short video is on foraging pine forest mushrooms in NSW, with more to come on sea snails and urchins, acorn foraging and wild greens. From there, who knows? We’ve got some hunting footage in the can, but it is strangely taboo viewing in Australia – perhaps as hunter who has been a vegetarian except for hunted meat for 25 years, we might actually be able to get to the nub of the fact that it is the closest we can get to where ethical meat comes from. We also haven’t really touched on growing at home, beekeeping or chooks; and we’re largely leaving fishing to the massive section of the internet and other media already dedicated to it. That still leaves an enormous amount of wild food to cover – stay tuned (on the new site). I have also started a major challenge of living on wild and homegrown food only for a year with the exception of just ten ingredients. This is written up on the new website, with more posts to come. Head on over and check it out HERE. It has been a long time off the blog; but finally, as we are gearing up for another Fat of the Land and Sea Week, I really should post the outcome of the original. All in all, a great challenge but a great success too. In part, the success can be credited with a reinvigorated wild and homegrown food passion that dragged my focus to some new collaborations and efforts away from here, but plans to ramp this up are still drifting around in the mix. At first, I thought that going for a week eating only homegrown and wild food wouldn’t be that hard. But it was. And then it wasn’t, and it wouldn’t be a second time around. I learned a lot. It all started a bit shaky with me failing at my hunt and finding my bees didn’t have any honey to spare. I left our bush block empty-handed except for some quinces – the worst forage for a hungry man as they need a lot of slow cooking to make them edible. Things were looking up with a huge haul of roadside apples, at least 30kg, on the way home. Mostly crabs too tart to eat out of hand, but fine for cooking or cider (it made the lack of honey even more of a shame, because it would have given a boost to either of those options). Opening the beehive – when there are no combs fully capped, no combs can be harvested. The first forage was a load of quinces. We’d decided on starting from scratch on Day 1, which meant that all I had to start on was something that needs a lot of cooking. 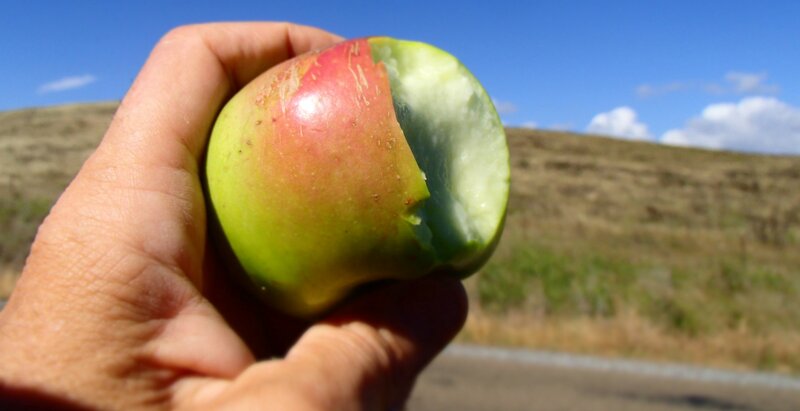 Breaking fast with some roadside apples – which are typically very tart and crabby (or worm-ridden if sweet). There was one tree that had some fruit that just worked for eating out of hand, but two tart apples were about all an empty stomach could approach until dinner. There were at least 30kg of these (of which half remain prepped in my freezer for Winter pies and booze). 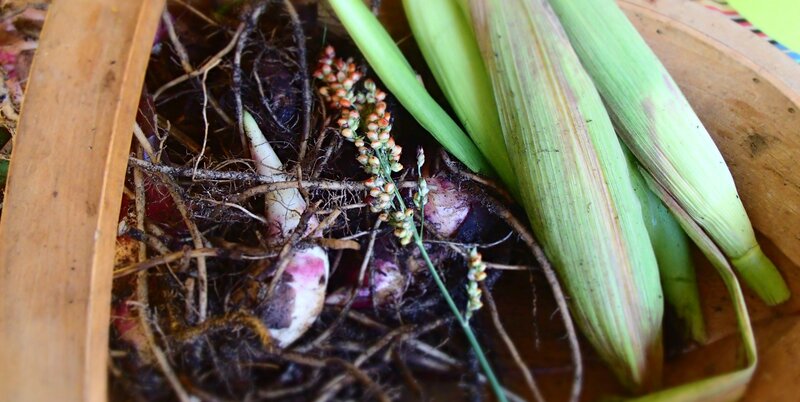 By the end of the day, things were looking positively rosy when I got back to find others converging on my house with very large amounts of hunted goat, speared fish and a fair bit of foraged and homegrown fruit and veg. A quick hit on our garden and we got busy dividing up so we could all go off with a few days survival secured. In celebration, I feasted on fish and stewed pears; and, because it was one of my two exceptions along with olive oil, I drank wine. Calamondins brought to the day 1 food-share. In my view, citrus is among food’s ‘critical infrastructure’, but very few are fruiting in Autumn, so these tart little kumquat-like babies were a godsend. Day 2 started badly and got little better. Through what I assume was a virus helped along by combination of exhaustion, being underfed and drinking too much wine, I was practically bed-ridden. I had been up in the night vomiting stewed pears and fish. All I know is that it wasn’t the food – it is not that often that 7 other people are signed on to eating the exact same stuff as you, and they were were all fine. 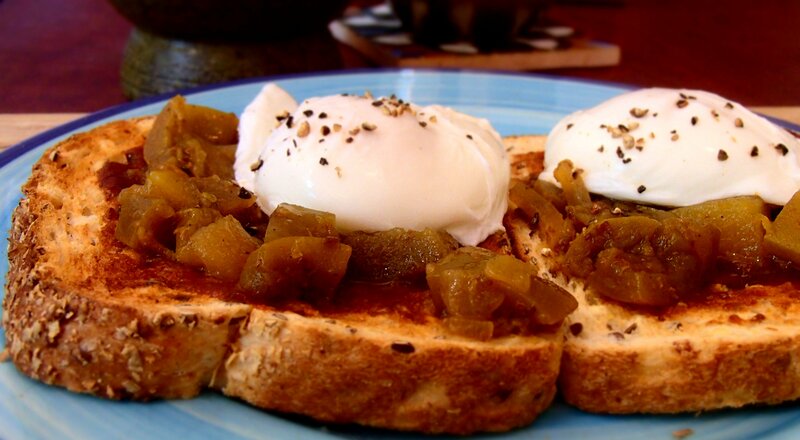 I awoke with no options other than stewed pears and fish as a ready-to-eat meal and couldn’t face either. What’s more I was faced with the prospect of cleaning a very sizeable haul of fish and getting it in the freezer before it went off. That did not go well. If you have never gutted a surgeonfish, which I hadn’t, do not do it on a weak stomach. While the flesh is reputedly perfectly palatable, the gutting is disgusting. It was more of a tainted retch than a full vomit I’d have to say, but with that, I had no real desire to eat any fish at all. Things stayed that way for the rest of the week – I forced down one piece of kingfish ceviche on day 7, but that was it. This was unfortunate, given that there was lot of fish in my freezer. Halfway through fish cleaning; normally something I enjoy, but not when wracked by nausea and when surgeonfish (not pictured) are involved. Day 3 found me still in pretty bad shape. I had slept 13 hours, but still felt like more. Or some caffeine. With milk in it. With cheese and butter also off the table, I realised how much I like dairy. There was also another forager down with a virus or something. I wasn’t the only one struggling. And another who had to cancel his fishing trip for the day because I was too ill to take to the waves. I’d managed to get a rabbit, some goat and half a roadkill wood duck in the slow cooker the night before and I managed to dig up and clean a kilo or two of edible canna (Queensland arrowroot) in the morning; it joined the meat with some herbs and I figured I had dinner for four – including the man down. Day 1 had brought in some hunted goat and (of all things) a roadkill wood duck, and the Day 2 hunting party came through with rabbit. Food was clearly not lacking in either quality or quantity, there was just a bit of lifestyle habit and illness to shift before it could become easy. A harvest of Queensland arrowroot for carbs (supplemented cursorily with some sorghum and maize that had seeded from chook food when their bedding is re-used as fertile mulch) and the stew became hearty as well as fancy. This was probably the first meal after I had properly embraced the FOTLAS idea properly – a delicious mixed game stew with garden starchy bits, parsley, chilli and Thai basil. I delivered some stew to a couple of others en route to trade some fish for some bunya nuts. 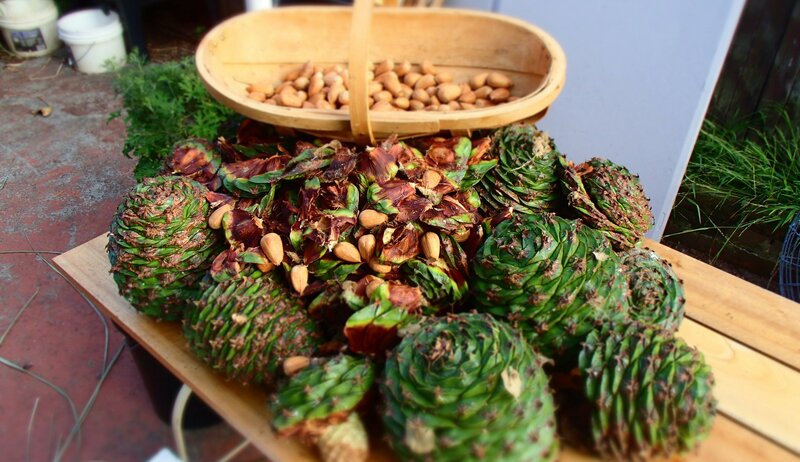 A mate was house-sitting an empty mansion with a bunya pine in it and just happened to send an email expressing his surprise at the size of the pinecones that were falling. Great big bombs laden with carbs – just what we were after! Things were looking up again. But we had lost one forager to the temptation of boardroom catering – and then there were seven. Bunya nuts in abundance, the famed feast food of the Bundjalung people. From this point on (about halfway) it became clear that hunger would only be a consequence of not finding the time to do the huge of amount of processing involved with a lot of wild food. I discovered bunya nuts. I had tried them before on a trip where we gathered some from a park in Wellington (NSW) en route to a few weeks in the bush, back before the internet was on phones, and worked out that they are not quite right uncooked, hard as rock overcooked and delicious when done just right. A tricky feat for novices with only a campfire to work with. Now with online suggestion and fancy new oven, we nailed it – 25 minutes at 200 degrees C. Figuring pine nuts were a pesto ingredient and with plentiful basil, pasta pesto was reinvented with a basil sauce over roast bunya nuts playing the part of gnocchi. I was back in good health and back on track. 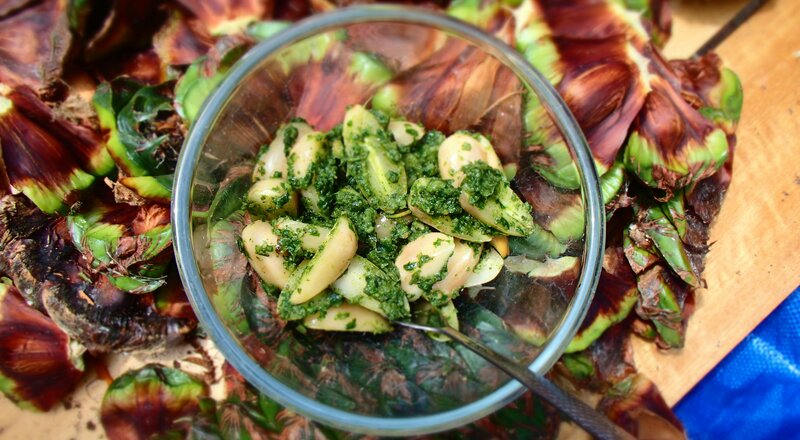 Bunyas used like gnocchi with a basil sauce – pasta pesto without the pasta. I was loving it! After doing the school run, I popped by the sea and had a dive for sea snails, picked up some sea lettuce and returned home. I set them aside (to become sous vide tenderised nuggets on skewers at the final feast) and replaced them with someone’s abalone from the previous weekend and some bunya nuts done with my favourite Thai combo of chilli and Thai basil (plus sea lettuce). Another forager had traded with a neighbour for some hunted venison – I took the time to give a backstrap fillet 8 hours sous vide with oil and a lot of herbs and had my first crack at ‘forager’s bread’. It was a recipe that I was later unable to recreate; a sheer luck combo of boiled Queensland arrowroot, leached acorns and bunyas, blended, flattened into rounds in a tortilla press and pan-fried (I’ve lost the picture and don’t know how to get it off Instagram, but it’s here). With tender venison in a perfect nutty flatbread following the abalone and chilli basil bunyas, I wasn’t just subsisting by the end of the day but laying a happy head down after two of my finest meals in memory. An early morning snorkel and forage. 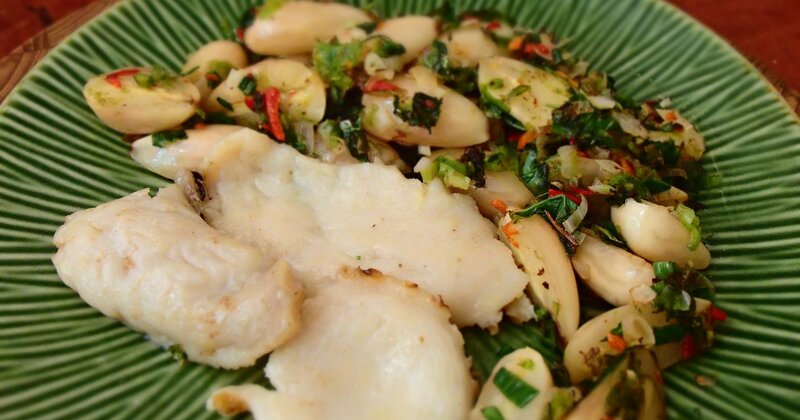 Chilli basil stir-fried bunya nuts and abalone. Having dug up a rather meagre harvest of kumara in the shady, sandy side garden on Day 1, I got around to snooping underground in the sunny front bed. 10kg of tubers came up easily from just a quarter of the bed. A pang of guilt that some others would have liked to know about this bonanza earlier was assuaged by knowing that the offer to come digging had been declined by all. I lunched on chilli basil super stew of rabbit, venison, goat, duck, bunya, arrowroot and roadside pears. Dinner came as huge roast kumara with bunya pesto (using native spinach, rocket and amaranth with the basil) topped with chilli and chives. For the first time of the week I was actually stuffed at the end of the day. Feast day. Up at 7 am to start the coals and rig up a whole goat on a spit on top of them, 3 kilos of kumara stitched up inside it. I try, unsuccessfully, to recreate the pliable forager’s flatbread, but nonetheless get some fried flatbread through with the help of the Squeeze. Fish arrives in perfect order – freshly speared kingfish. Home-made wine, shop-bought beer, vodka with foraged mint / lemon myrtle / stevia syrup and we settle into celebrating our success and laughing over the struggles. Fat of the Land and Sea Week Spring is coming! Plans are now confirmed for Fat of the Land and Sea Week Spring 2015. Sunday 11 – Saturday 17 October. To make it more accessible, especially for people with limited wild and homegrown resources or limited time while still working through the week full-time, we’ll be tweaking the rules. In some form or other, pretty much anyone can get involved. Dates to be confirmed, but we welcome anyone and everyone to come aboard. Wild and homegrown food every day for a week. This may be that something is wild or homegrown every day or in every meal or, at the full-on end of the spectrum, that everything is. You can nominate some specific ingredients as exceptions. As many as you like for whatever reason. This would usually be things that are central to your cooking (olive oil, some seasonings), personal health regime (yoghurt, turmeric, oat bran, your weird kale-based kombucha, whatever), small pleasures in life (coffee, wine, chocolate) or a staple to keep you from starving (rice, potatoes, bread) while you make the challenge about what goes with it. You may require of yourself that it is all gathered within the week or you may allow yourself to get a start stockpiling some wild and home-grown food beforehand. That might be just the previous Saturday or that you start stocking the larder and freezer now (I’ll be allowing larder use so I can keep a better handle on the day job). Trading, gifting and generally doing the week in collaboration with friends or strangers is encouraged. It is a week to celebrate and a week to make you think about your own personal engagement with food and your place in a food network. Making it local means people can do things like drop in for something someone else has lots of (like fish or greens) midweek or make a dish and drop it around to others. It runs from a Sunday to a Saturday; and on that Saturday, there should be a feast! Fat of the Land and Sea Week 2015 is on! Eight city folks living on hunted, foraged, fished and home-grown food only. Altogether too much too write about with too little time to spare, so I’ll be doing well to just update this post with each day’s haul. It will otherwise be done in pictures on the Instagram feed to the right and on Instagram itself @foragersyear. There will also be posts by others on Instagram using the hashtag #FOTLAS2015. Come along for the ride. 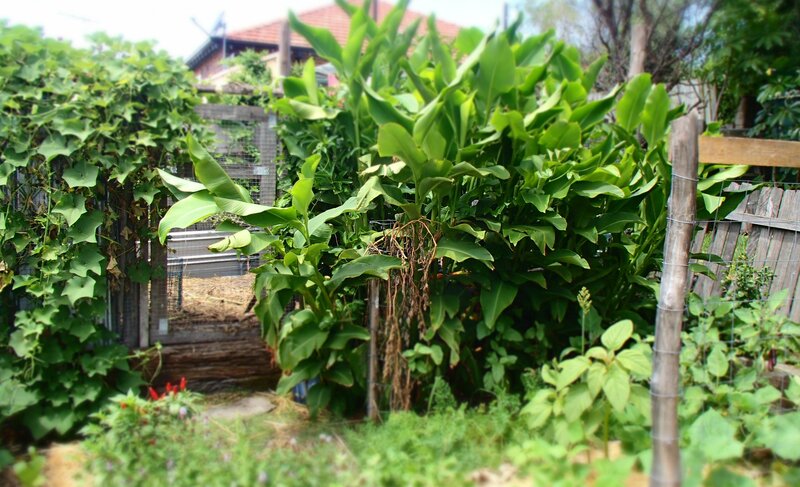 It seems like kind of a big thing, in the modern urban workaday world, to live for one whole week only on home-grown and wild food. Outside of that world, it might seem as unremarkable a challenge as going without a fax machine. 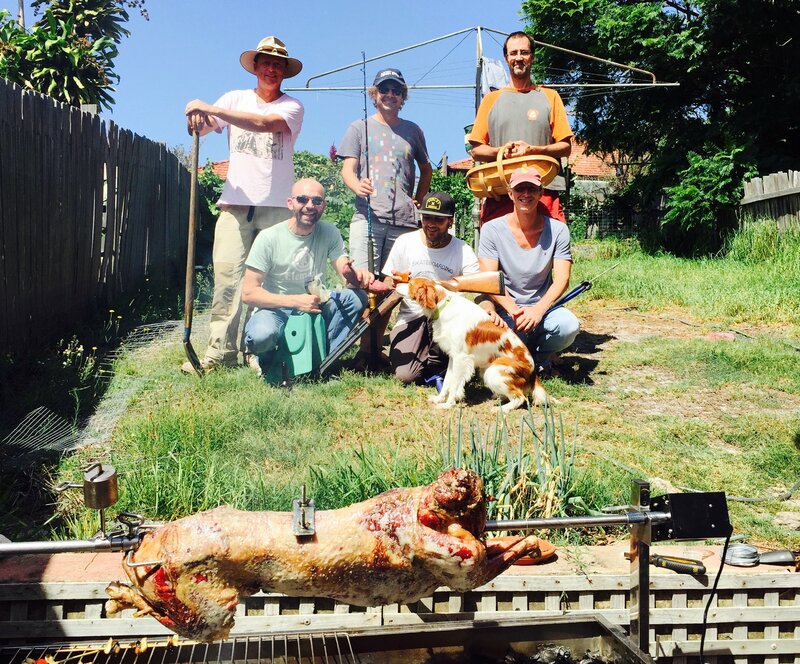 But the eight of us doing it are mostly desk workers, in small houses and apartments in the city, albeit foragers, fishers, hunters and vegie growers to varying extents in varying amounts of our spare time. It isn’t intended as some desperate challenge where a reality TV version would find some of us in starving tears. It is intended as a celebration. Kind of like an old-fashioned harvest festival. We have enough up our sleeves in terms of backyard crops, fishing kit including boats and skills, hunting gear, property access and foraging knowledge to suggest that hunger will not be a huge shadow hanging over us. We are doing it because we never have before and because we can, fully aware that this means that we are very fortunate people. It begins on Sunday 1st of March and ends with a feast on the following Saturday the 7th. At the discretion of each of us on board, we can nominate exceptions. I could call mine the ‘amphora rule’, allowing me olive oil and wine. Another guy is allowing previously foraged condiments; of two caffeine loving blokes who live near each other, one has chosen tea and the other coffee and plan to meet regularly to make each other a cuppa over food swaps; one guy is hedging his bets with flour – quite sensible really, allowing the week to be the fun that it is meant to be with a backup sure to guarantee him a seat at the final feast table of set-aside treats. It will be busy, ‘hard work’ when added to the fact that we will all be largely keeping up the real jobs, so there will be no blogging at the time. Instead, I have gotten my head around Instagram to try to document the week as it unfolds. Images will come up here (at right of screen) if you aren’t on Instagram. If you are, my pics are @foragersyear. There will also be posts by others on Instagram using the hashtag #FOTLAS2015. Come along for the ride. 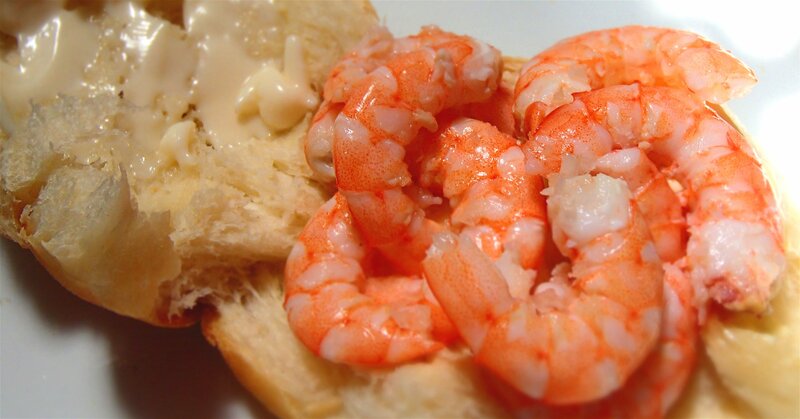 When I was a kid, a kilo of school prawns and some mayonnaise was considered fast food for a family. With perhaps some white bread to wrap them in. McDonalds also came on the scene. It’s a terrible shame which one the world has managed to leave the most room for. 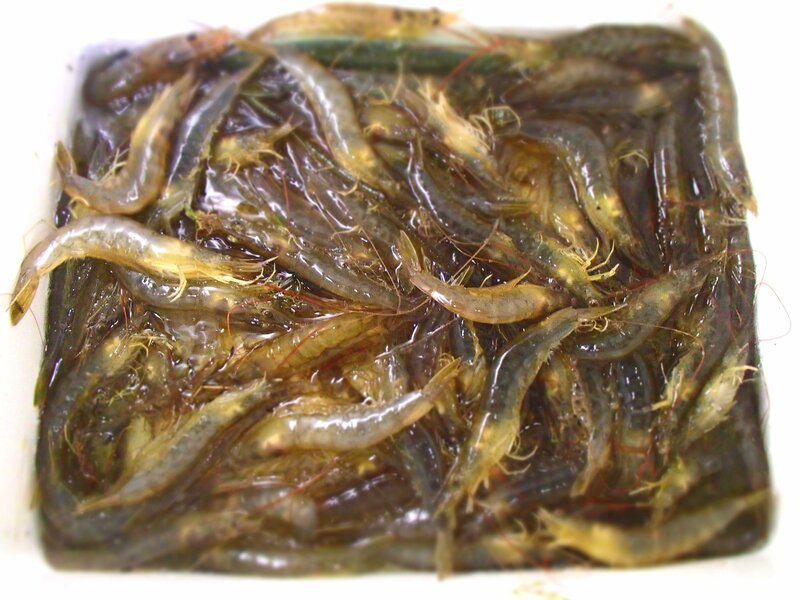 Commercially, a lot of wild prawn fisheries are in a bad way, in terms of their numbers, bycatch impact, toxin uptake and/or other aspects of their sustainability. 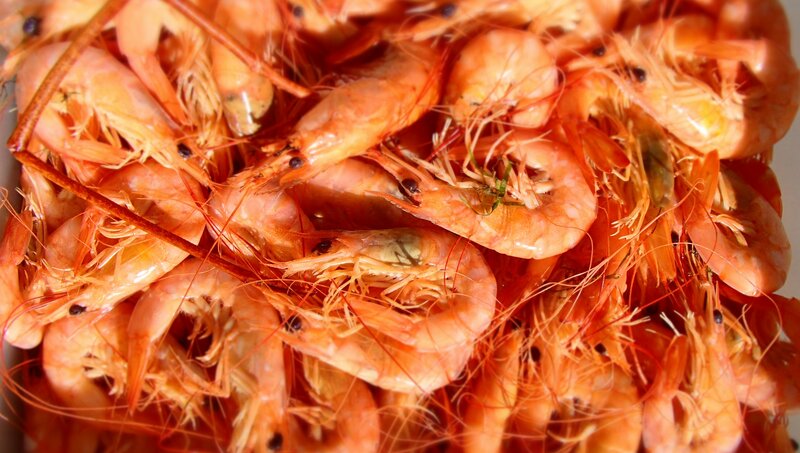 The prawn farmers are also a mixed bunch; some working towards some pretty sustainable food production, and others having a shameful toll by digging up wetlands, pillaging the sea for the feed inputs and discharging harmful effluents (Asian imports tend to rate the worst on these scores for prawns on sale in Australia). All in all, it is often very hard to know what you are buying. So, until some decent labelling laws come in, I pretty much don’t buy prawns at all. This is where one the great joys of foraging means the most – there is no better way of knowing where your seafood comes from than getting right into the water and going after it yourself. I have been longing to try my hand at prawning for quite a while now, but I just wasn’t sure of how or where to give it a go. Some friends who knew this just so happened to come from a Central / Mid-north Coast family who take their prawning seriously. A casual invite to their last session of the season was leapt upon within seconds. “What do I bring? Torches, a scoop net?” I asked, “You name it, I’ll get it”. “A pair of sandshoes” was the answer. A three hour drive to Bulahdelah to their family seat, a laid-back lunch of wonderful homegrown abundance and then off to the secret spot. I don’t actually know how guarded people are about their prawning spots, because the prawns don’t live there – they are just passing through on their way to the sea to breed. Nonetheless, having been afforded the dignity of not being blindfolded for the journey, I will leave locations out of it. 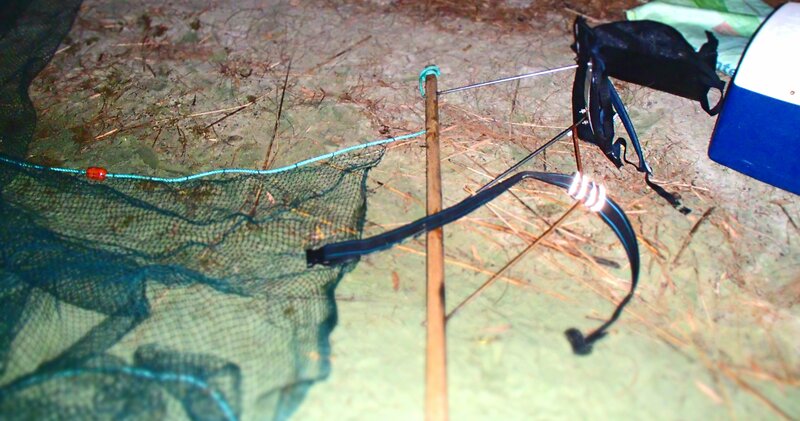 The prawn net itself is a pretty impressive piece of kit. 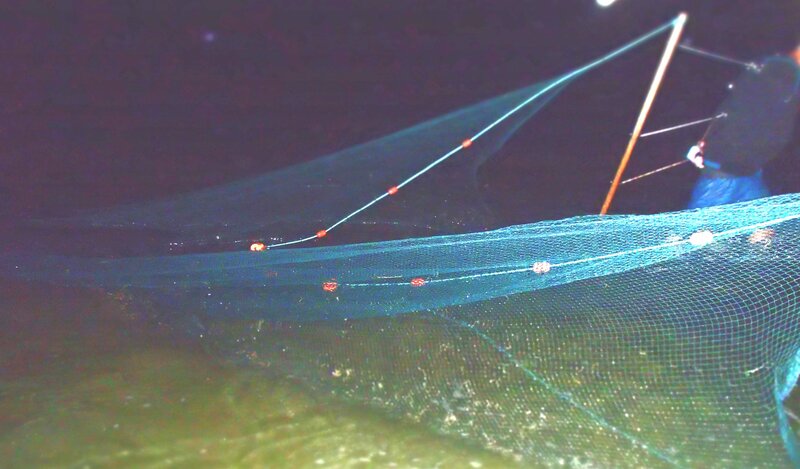 Six metres of 30mm aperture net feeding into a tail end where, all going well, the prawns accumulate. There are floats along the top rope, weights along the bottom and 1.7 metres of net between them. It is all held square by two sturdy poles that must be dragged through the water by hand. Normally people hang on to ropes to drag it, although we had the benefit of an ingenious homemade custom rig with harnesses. The care and detail of these gave an early indication that I was under some pretty expert tutoring. 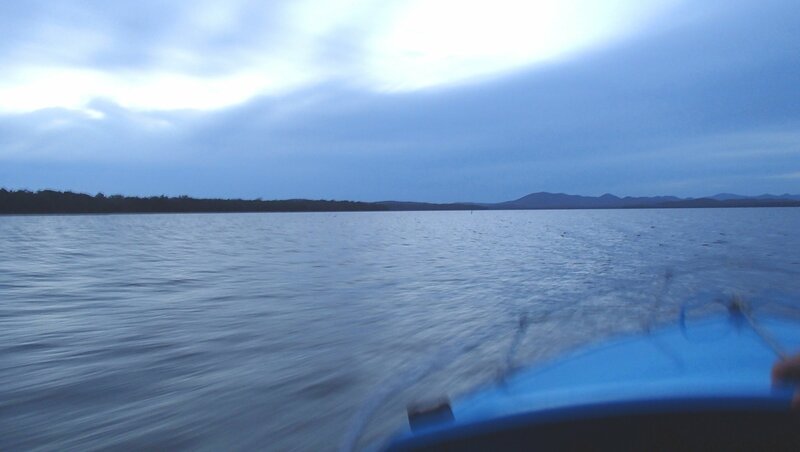 With the calculations about tide, moon, time and place made long before with tide charts and a hefty store of experience, and with the biggest and best set-up possible under NSW rules, it seemed that the hardest bits had been done. From there, it was just a walk through the water with another bloke five metres away doing the same. Simple. Until you start thinking about being belly deep in water in which to my mind there ought to be stingrays to tread on and bull sharks to be paranoid about. With phosphorescence in the water, your legs glow a little as they move, and so does the wake of fish that might swerve in front of you. Things start getting a little creepy for a bit until rationality reclaims its ground. The guys who have been doing it for decades had no concerns, so that did for me. It turns out that the biggest danger is in fact a 5cm fish that looks not much more menacing than an aquarium goldfish – the fortescue (Centropogon australis), with spines that are said to give an agonising sting. And the danger isn’t even really in the water (because of the sandshoes), but sorting the catch when comfortably on dry land. Or perhaps that is the second biggest danger, behind missing out on being altogether chuffed with the realisation that you are out there getting amongst it on a beautiful starry night in paradise. Successful prawning can go a long time into the night. If another pass with the net meant another kilo or two of prawns, you would take it. And another, until fatigue set in. And then the processing rules are pretty firm – you catch ‘em, you cook ‘em, that night. Unfortunately, we were safely in bed around midnight. This meant something under two kilos put away; where being up until 3am with twenty kilos would obviously have been preferred. However, it was enough at least for one glorious feed the next day and a few extra snacks. With prawns, like a lot of seafood delicacies (abalone, crab, whitebait), simple is best. Just a little salt, fat (like butter) and tang (lemon) – or all three in the form of mayonnaise. If accompanied by anything else, just the simplest white bread fits the bill. Don’t let fine food snobbery lure you into some dark sourdough rye and angel-sweat-infused aioli which ends in you not tasting the catch. Wine and a nap would have topped it off to perfection. But it was water and a three hour drive back to the city instead; all the while planning on getting back out there when the season, sunset, tide and moon next align. Saturday 5th December is looking good for me – I can hardly wait. Tailor (Pomatomus saltatrix; ‘bluefish’ in many parts of their very wide distribution around the world) aka ‘choppers’ around here for their predatory method of coming in behind their prey and chomping with razor sharp teeth, are a fish that have recently made me feel a little guilty, truth be told. While I am quick to defend the culinary virtues of some fish that some anglers are quick to leave behind as bait or ‘rubbish fish’ (like slimy mackerel, bonito, Australian salmon, leatherjacket and even yellowtail scad), tailor has strangely been the fish I’ve been happiest to bypass. Soft fleshed fish, to the point of being hard to work with for many recipes, hasn’t suited my idea of sea meat, I suppose. And yet allowed to be just that – tender even with quite careless cooking – it isn’t necessarily a bad thing. But perhaps the bigger thing is that tailor fishing has rarely fitted in with my ideal of a day out on the water. They are estuary fish, and in my part of the world that means Sydney Harbour and Botany Bay. Beautiful in their own right, but busy. Approached from the sea, Sydney is (unbeknownst to most) the world’s most spectacularly walled city. Huge, sheer sandstone cliffs rise up like ramparts no castle will ever match. There is an extraordinary ocean wilderness on one side and one of the busiest modern cities in the southern hemisphere on the other (check out my mate Normy’s paraglider crossing of the heads youtube video for some spectacular imagery). The thing is, I so much love fishing outside the walls that tailor have somehow seemed like second class fare to be taken en route. Kind of like a pastry from a petrol station – hard to resist but eventually unsatisfying. But with an onshore sou’wester and choppier seas than anticipated on a recent outing keeping us from the open water, bay fishing it was. The vast spectacle of the open Pacific would have been all too likely interrupted by the threat of small boating disaster and the inevitability of seasickness. So, a backdrop of container terminals, airport runways, city skylines and scores of other boats on Botany Bay became the setting of a dedicated harvest of the best return on offer. Tailor. The catch was mostly taken not long after dawn broke, between 6 and 7 in the morning. They are savagely ravenous hunters. We (2 of us) trolled small lures until one of us had a hit, then as they retrieved the fish, the other cast small silver lures in the direction of the action, usually hooking up. When that dried up, we moved on to another troll and repeated, diving birds generally leading the way. We stopped well short of a bag limit, figuring we were missing out on other options that never came through, only to come back to find them (and the Australian salmon chasing the same baitfish) a lot more picky about lures in the full light of day. Most fisherman tend to favour pan-fried or battered and deep-fried tailor – but a lot of fishermen tend to prefer almost all fish that way. Served with beer. 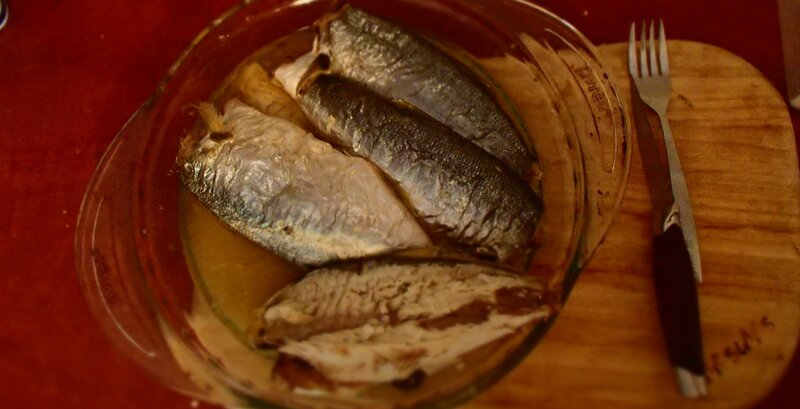 Other fishers’ favourites include smoking and the cheeky recipe offering of “use as bait to catch a snapper [Pagrus auratus]; then cook the snapper”. Whole baked fish seems the best idea to me though. For one thing, and who hasn’t over-cooked firmer non-oily fish like flathead, you are unlikely to get it wrong and dry it out. Tailor are indeed soft and they do indeed taste a bit oily and fishy. Some find baking mutes the slightly strong taste. You can still catch that flavour and use it well by catching it in pan juices and then a sauce. A sorrel sauce (like here), or in any case something with both lemon and herbs (parsley, basil, mint) to balance the strong tailor taste, but using less oil than most recipes may advise and perhaps a bit more salt. Or in my case, pie gravy – this time a variation below on a recently posted recipe (here) – because I am currently a little bit obsessed with the delights of fish pies. Lay four tailor out, just overlapping in a baking dish. Drizzle with oil and salt, giving it a rub if you are inclined (don’t worry too much about adding any other flavours because they come later). Cook for 30 mins at 200C; skin should be crinkly but not burnt and the flesh should pull easily from the bone. Let it cool and deflesh; keep the skin with the meat. Pour the pan juices and the fish frames into a pot with a big bunch of herbs (any or all of (in my personal choice of priority) kaffir lime leaf, lemon myrtle, Thai basil, parsley, thyme, bay leaf, sage, rosemary, Vietnamese mint, lemongrass, dill, sweet or perennial basil, mint, fennel, marjoram, oregano, celery and/or lovage). The amount of herbs should be pretty huge, to the extent that it would be silly expensive if they were all shop bought, so it will probably hinge to a great extent upon what you can lay your hands on. Add a cup or so of water and lay 1kg of mussels on top (NZ greenlips, pretty affordable as far as seafood goes, a good sustainable option and a great contributor of both meat and stock flavour – always buy them frozen (outside of NZ) because they all leave the country this way, so why compromise freshness with ‘thawed for your convenience’). Steam the mussels (in the shell ideally) and stop before they start to lose any plumpness. Allow it to cool enough to pick out the mussel meat. Strain the stock and put enough of in a jar to shake with, and disperse, 3 Tblsp flour. Sauté a diced onion and then some crushed garlic in the pot with a generous chunk of butter and when it is golden/translucent, put everything back in with it (with a tsp of smoked paprika if you like) and stir, stir, stir. Sprinkle extra flour if too runny or add milk if too thick, all the time stirring. Hopefully the mix can take ten minutes of this so the flour gets a decent cooking. The tailor will be broken down into a fishy gloop with the nuggets of mussel suspended in it. Add a cup (or otherwise to taste) of grated cheddar cheese, stir in and pour the lot in a baking dish that works as a pie dish. Allow it to cool before covering with puff or other pie pastry and bake until the pastry is right. As much as one may like the idea of treading a fairly harmonious path in a life that seeks to engage with other plants and animals, any vegetable grower is typically involved in some spiteful battle or other with insects throughout the year. Not all of them, but certainly a loathed few. At the moment, it being summer in Sydney, my most recent nemeses have been Queensland fruit fly (Bactrocera tryoni). They have put an end to my tomato crop (Solanum lycopersicum). This year, there will be no big canning session filling jars of passata and no big colourful salads of tomato chunks strewn with basil leaves and light salty white cheese. Fruit fly has hit my two big frames of tomatoes hard and I have cut them down (even the cherry tomatoes). For the big toms, it was an ambitious idea from the outset, with neither pesticide nor organic control (I just can’t go for the poison of the former or the expense and effort of the latter) or dumb luck to aid me. 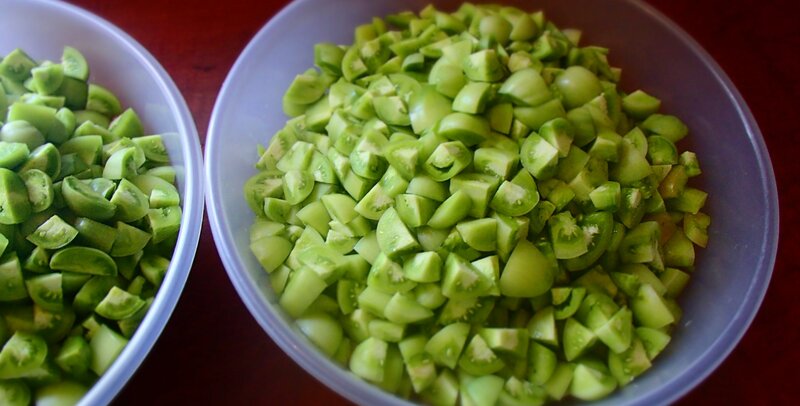 I first thought I was admitting defeat, but with a kilo of green tomatoes per sacrificed plant, I have found that I am able to take some solace in the idea that, to some extent, I am simply quitting while ahead. Cleaned up, through cutting out the infested fruit or parts thereof, I have at least salvaged the wherewithal for enough green tomato chutney to last a year (and a tomato hot sauce which isn’t too far off a mix of this chutney and previously described recipes for plum ketchup, crab apple jelly, and chilli jam, with a big bunch of extra chillies for good measure). The lesson learned for next year: Plant early varieties of tomatoes; as early as possible; only small cherries and cherry romas; hope from some ripe ones before new year; and then on the first of January, harvest the lot and make another batch of chutney. This recipe is a mix of fairly standard green tomato chutney recipes from Australia and New Zealand (and very probably Britain and elsewhere). 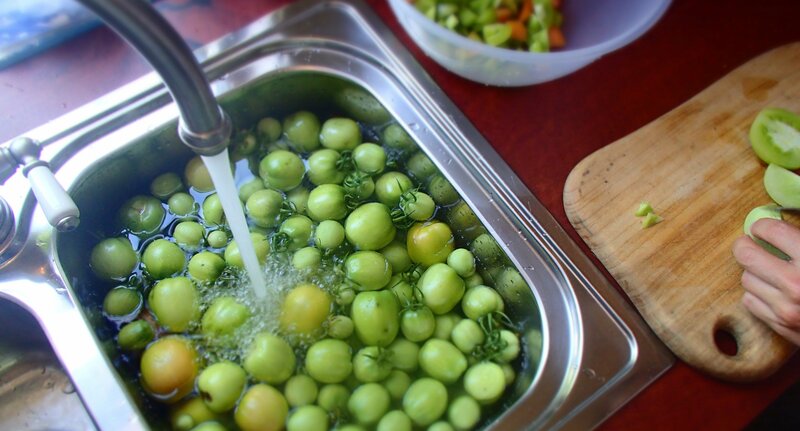 It is scaled to 1kg of green tomatoes in terms of ingredients to be easily adjusted. The big room for movement is with chillies and garlic – if you like them, you could increase fivefold. Heave it all in a pot and simmer, uncovered and free to reduce, for an hour or two. Ladle into scalded jars. If after getting most of the chutney out, the last couple of jars worth seem a bit runny, pile in a heap of chillies and garlic and keep cooking it down for a darker, fiery version. They say to leave it for a few weeks to meld, but I would call that optional.